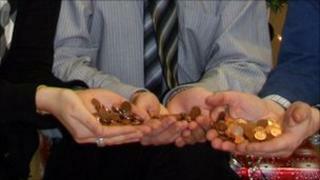 Warwickshire County Council staff have raised £100,000 for local charities by donating odd pennies from their wages. Some 4,500 workers and retired council staff volunteered to take part in the Pennies from Heaven scheme and donate up to 99p each month. The council joined the scheme four years ago and recently hit the £100,000 total which will go to two hospices. Myton Hospice said the donation would help care for the 2,000 patients it looked after each year. Myton Hospice has bases in Warwick, Rugby and Coventry and received more than £50,000, including Gift Aid, from the scheme. The council said monthly donations to the scheme exceeded £2,500. Martyn Thompson, of Warwickshire County Council, said: "The beauty of this scheme is in its simplicity, and it shows how donating a few pennies each month can really add up to a significant sum, which makes a real difference to our chosen charities." The second charity to benefit from the fund will be Mary Ann Evans Hospice, in Nuneaton. Fundraising manager Janet Kavanagh said it meant local people were able to receive support and care at what was a very difficult time. She added: "Your generosity in remembering the Mary Ann Evans Hospice will enable us to continue our caring and provide support for our patients, their families and carers."